Today’s featured yarn is Berroco Candy FX, on sale at 40% off. This is a beautiful shimmery yarn with little bobbly bits on a string. It’s best used to glam up a second yarn that has more substance but less glitz. Rows 1 & 2: Slip 1st stitch, knit to end. 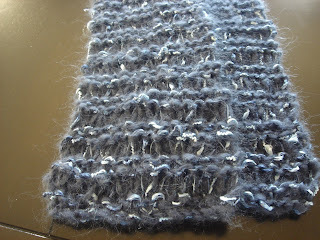 Row 3: *Knit 1, YO*, to end of row. You’ll have 32 stitches on your needle. Row 4: Knit to end of row, dropping off all YO’s. You’re back to 16 stitches. Cast off when the yarn is almost all used up. Couldn’t be simpler. 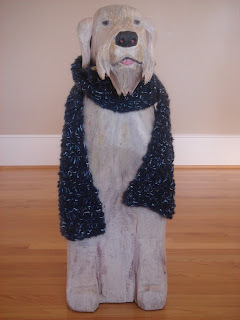 I think I’ll knit this scarf for last minute Christmas gifts. Only 62 knitting days left….